Sarah Paulson’s American Horror Story: Apocalypse Character Is … an Evil Bingo Host? It wouldn’t be American Horror Story if Sarah Paulson weren’t overachieving, and so, in the eighth season, she’s playing three different characters. 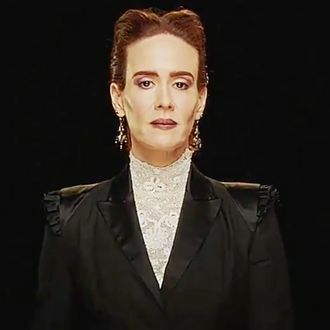 There’s Cordelia Goode (her character from Coven), Billie Dean Howard (the medium she played in Murder House), and as you can see in the video below, a creepy new character named Venable. Judging from the teaser — the latest to be released — Venable hosts a … bingo night? Where people die? American Horror Story: Apocalypse, which will also include all those witches from Coven somehow, premieres September 12. Maybe don’t enter any sinister lotteries before then! Sarah Paulson’s AHS: Apocalypse Role Is… an Evil Bingo Host?